Review: "K2: Book of the Dead" - Sea of Tranquility - The Web Destination for Progressive Music! Book of the Dead - an old-school prog-rock concept album based on ideas and stories taken directly from the Egyptian "Book of the Dead" - would be a creepy album even if vocalist Shaun Guerin had not passed away in 2003 shortly after recording his performances for this record. Guerin, who also played drums in Rocket Scientists and handled lead vocals in the Genesis tribute band Cinema Show, possessed a dusty voice with uncanny similarities to Peter Gabriel. Indeed, K2 invokes plenty of Gabriel-era Genesis, as well as Pink Floyd, Yes, Marillion and Arena. Pronounced "K Squared," K2 is the brainchild of Ken Jaquess, a multi-instrumentalist for the neo-progressive outfit Atlantis, who recruited a slew of talent for the project. In addition to Guerin, guitarist Allan Holdsworth (UK, Level 42), keyboardist Ryo Okumoto (Spock's Beard), drummer Doug Sanborn and classical violinist Yvette Devereaux fill in the blanks in this Book of the Dead. Lyrically, Jaquess weaves an intricate pharaoh-based tale of death and rebirth. Packed with references to rituals, sacrifices, temples, gods, spirits and the good earth, the album demands listeners' imaginations as it captures their fancy. The album is divided into five chapters, and purists will revel in the 23-and-a-half-minute opening chapter, "Infinite Voyage," which boasts plenty of Moog. Those sounds get even fatter on the memorable third chapter, "The Edge of Light." Meanwhile, the sparse instrumental fourth chapter, "Aten (Window of Appearances)," segues into the redemptive final chapter, "The Cloak of Ambiguity," which brings Book of the Dead bouncing to a hopeful (and, considering Guerin's death, prophetic) conclusion: "As the clouds depart, I reach the deepest valley/And cross through the gates, reflected in my eyes." First a disclaimer, do not listen to the opening track "Infinite Voyage" from K2's new CD Book of the Dead while operating heavy equipment. This 23+ minute track will steal your attention, take your mind into another realm and leave you exhausted. Ryo Okumoto weaves a slow spell around the vocals of Shaun Guerin. The trance is set, the mind is engaged, and the song just keeps building and you keep getting sucked in deeper. Yvette Devereaux's violin makes this song. It is like the first time you heard Apercu from Kansas' debut CD. You can not believe how pretty, yet powerful, a violin can sound. You can never compliment Allan Holdsworth enough; his guitar playing is that good. As a dedication to the Egyptian "Book of the Dead", the CD does a good job of introducing themes and passages, but always interjecting the haunting keyboards that keeps the mystic mood alive. Ken Jaquess, composer and masterful bass player, keeps everything together. The bass, to my enjoyment, is high up in the mix on "Infinite Voyage". Since half of the CD is "Infinite Voyage", this CD will get judged by this epic more than the remaining 4 songs. "Mirror to the Spirits" mixes acoustic guitar themes around heavy accented keyboard themes. The song plays off of "Infinite Voyage", but takes its own path. This time Devereaux's violin is used as orchestration. "The Edge of Light" is a little more up-tempo with the violin used more as the solo instrument. The singing starts to get the same here, and the best parts are the unique keyboard passages of Okumoto. This song repeats a little and doesn't quite hold strong for all 7 minutes. "Aten" slows way down and allows Jaquess and Holdsworth to spin a sound-web for 3 amazing minutes. This is the only time on the CD where Jaquess uses this project as a showcase for his talents. It is fitting and the song keeps that mystical feel, taking it to the lower octaves before "Cloak of Antiquity" spins everything together. The final track really shows what this band could sound like if let loose. In keeping with the CD's overall theme, the singing again sounds much like the other passages, but when the instruments get to interact, it is pure magic. This CD is a must have, simply for the opening epic "Infinite Voyage". When listening to the entire CD, I found the vocals a little repetitive and "The Edge of Light" a little long winded. But these two minor flaws should not keep anyone from purchasing this CD. Just stay off the fork-lift while listening. For many, the name Allan Holdsworth is enough to seek out Book of the Dead, a project put together by bassist Ken Jaquess, who has played in bands such as Newcross, Dresden, and Atlantis. Here with K2, he has assembled an all-star line-up that includes guitarist Holdsworth, Spock's Beard kayboard player Ryo Okumoto, violinist Yvette Devereaux, drummer Doug Sanborn, guitarist John Miner, and the late Shaun Guerin on vocals, who sadly passed away shortly after the recording of this album. Book of the Dead is progressive rock, pure and simple. Thanks to Guerin's Peter Gabriel-ish vocals, there is a very Genesis-like feel to the album, but one can also hear the influence of UK as well, seeing as the unmistakeable guitar talents of Allan Holsdworth are in fine form throughout this CD, in many spots weaving impressive passages around the lovely violin lines of Devereaux. She acts as K2's Eddie Jobson on the epic "Infinite Voyage", trading soaring solos with Holdsworth before Okumoto comes in with some flashy Moog jaunts of his own. Jacquess adds some nice melodic bass work on this track, as well as additional keyboards (great Mellotron sounds! ), but it's his penchant for writing catchy and memorable melodies that really stands out, especially considering that much of the material here is epic prog rock with many solo spots. Guerin's vocals soar on "Mirror to the Spirits", an upbeat song with meaty bass grooves, loads of organ and other keys, while the mysterious "The Edge of Light" sees the band move into dark prog as well as fusion territories, with Devereaux's violin weeping and crying in and out of the mix. After the brief instrumental "Aten", the album closes with the adventurous "Cloak of Antiquity", another strong Genesis flavored cut, featuring great keyboard and violin playing, not to mention Sanborn's nifty grooves. Holdsworth's wonderful solo on this one just drips with tone and technique, and you just wish it would go on forever. 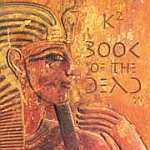 Book of the Dead is one of 2005's early surprises, and due to the passing of Guerin a few years back, there's no guarantee that K2 will ever follow this up with another recording. If not, they have left behind a very strong progressive rock statement here, one that will be enjoyed for many years to come. It was interesting to listen to K2 "Book of the Dead" from the perspective of a John Miner fan. From what I am hearing John actually did all the guitar on the album and Allan came in as a guest soloist only. Obviously Prog Rock Records is going to push it as an "Allan" thing for sales and understandably so.... but all the textures and colors you here in there from John, is what is giving it that classic old school prog feel. Track 2 "Mirror of the Spirits" is all John exept for the obvious Allan solo near the end. I enjoyed your review though..